Habit: Annual, perennial herb, subshrub. Stem: generally erect, generally branched from base. Leaf: cauline, alternate or opposite, entire or lobes 3--9, pinnate or palmate, linear to narrow-lanceolate or spoon-shaped. Inflorescence: open or dense clusters or cyme or flower 1; bracts leaf-like; flowers sessile or not. Flower: corolla funnel-shaped, salverform, or bell-shaped; stamens attached at 1 level, included or exserted, pollen yellow. Fruit: capsule, valves 3(4). Seed: generally many, when wet gelatinous to not. Species In Genus: 25 species: western North America. Etymology: (Greek: flax flower) Note: Other taxa in TJM (1993) moved to Leptosiphon. 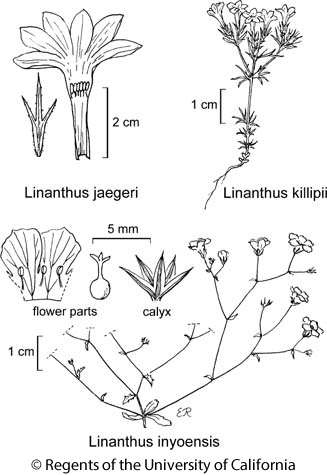 Linanthus bernardinus described since TJM2 (Fraga & Bell 2012 Aliso 30: 97--102). Habit: Annual, hairy. Stem: 5--15 cm. Leaf: lobes 3--10 mm, linear. Inflorescence: flowers generally sessile. Flower: calyx 6--7 mm, membrane as wide as lobes; corolla funnel-shaped, tube 4--5 mm, yellow, throat 3--4 mm, yellow, lobes 3--4 mm, generally white, base with 1 red mark; stamens exserted. Fruit: < calyx, obovoid. Seed: 6--12, not gelatinous when wet. Chromosomes: 2n=18. Ecology: Dry openings in pinyon/juniper woodland; Elevation: 1700--2400 m. Bioregional Distribution: c SnBr (Baldwin Lake). Flowering Time: May--Jun Note: Threatened by development, vehicles. Citation for this treatment: Robert Patterson & J. Mark Porter 2015, Linanthus killipii, in Jepson Flora Project (eds.) Jepson eFlora, Revision 3, http://ucjeps.berkeley.edu/eflora/eflora_display.php?tid=31058, accessed on April 19, 2019.
c SnBr (Baldwin Lake). Markers link to CCH specimen records. Yellow markers indicate records that may provide evidence for eFlora range revision or may have georeferencing or identification issues. Purple markers indicate specimens collected from a garden, greenhouse, or other non-wild location.